Mike brought up the Locust Grove Girl Scout murders. That was a wild time at Channel 8. Most of the news dept was camped at Locust Grove and the production dept was out at Southern Hills doing the US Open because the ABC techs were on strike. I was one of the people left at the station and was kept very busy. They had a spare line to NY for the Open and ABC News was using it to feed Locust Grove stories. One day, Glen Blake came into the control room and gave me a reel of film and told me they would be feeding it to NY to tape for air in the network news. As soon as I was done switching Gilligan, I loaded up the film and we fed it to NY with ABC reporter Steve Bell voicing it live from A audio. He messed up the first time, so they told me to re-rack the film. As soon as I was ready they gave me a 10 second countdown to roll the film. As I waited, I looked on the air monitor and saw Barbara Walters with an Okla Murders graphic over her shoulder. When I rolled the film, there it was on the network. I was a nervous wreck, especially because they got off the film with about 3 frames to spare. Ok Ok. First - regards the Auricon's - I helped Ricardo schlep one around once or twice, mostly at the Tulsa Theatre and a few other venues, I was spare Battery/spare Magazine Guy. Yes, they were heavy, yes, Life Without Tripods sucked, but they did bring back the goods. Later in life, I was to wear a BodyPod myself when the TK76's appeared at KTUL, and P. Kent Doll, Carlos Hernandez, Ricardo and my small self went out to shoot Oklahoma Foobahl. At this point in time, the station *did* have CP16's, but neither of us worked in News. We was production entities in a world where the News dept. (finally) was (were, for you Anglophobes) producing a positive balance sheet. They got all the new toys, and Richard was deemed to use the leftover stuff. I am not sure of the Gig, it was Todd Rundgren or Frank Zappa, in any case, It was a hoot. Per Mr. Bruchas's remarks about HDTV - I know too much about it, and the bottom line is thus - It's gonna cost way much to encode it, and not a bother to store/retrieve it. As I'm in the storage biz, It's not my prob. Oh. Wait. I'm a Systems Integration Engineer. I Hope and Wish everyone in my former life in Tussa is doin ok. Y'all can email me privately, as usual. Take care. Okay - TV news old-timers. Do you remember when KPRC-TV of Houston, TX - shot video of a famous '70's Texas prison riot (maybe Huntsville?) on Akai portable color camera and recorders? They were experimenting with them replacing film. You had a little tube camera - cabled to a 1/2" tape recorder. 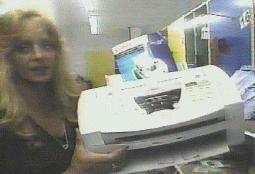 It pre-dated Sony technology by a few months. They speeded video in by a private and small microwave company to KPRC - not via AT&T Long Lines. Exsqueeze me - I am old - FLEER bubba gum. Talked to Pete Abrams today in Jax, Florida - he just back from NH. He is building High Definition TV video servers. Like so many an engineer - HDTV has become an expensive and dirty word to him. Rumors of Carlos Hernandez's retirement - out of the "news game" - are still being heard. Like he is moving to Lake Tenkiller after years in Tulsa, OKC, Dallas, Houston and DC. Maybe when he is 80 or his knees and back give out - but not soon. He continues as Chief Photographer at Fox O&O WTTG here after defecting from Gannett's WUSA-TV. He also is invovled with NPPA's video side. NPPA - National Press Photographer Assn.is a professional organization that encourages continuting member education. Still shoots/edits with the best of them - nationally! In the aftermath of those horrible Girl Scout murders in Locust Grove in '77 - I was in my period as part-time photog at 6/regular production studio director. I was shooting a bite from the D.A. there near the crime scene and then drove to Keystone or Mannford to shoot something else in the old KOTV Ford sedan with bald tires. No not the LTD. I realized I could not find my wallet or driver's license. Fearing my license would be found in Locust Grove by a deputy and my name on a statewide manhunt and me shot on sight - I called OHP to report it missing (yeah, sure at a major murder scene, uh huh...) and drove very carefully back to 6. Could not find it the next day (so I did NO driving) and I think someone else found it wedged under seat of the Ford a day or 2 later. Do you mean FLEET or FLEER trading cards? Back when I was a sprout in grade school in the late 60's/early 70's, I remember Santa's Christmas Rocket Sled. It was some kind of a bus type affair decked out to look like a space ship. Anybody have a photo of that? This was about the same era that Southroads Mall used to have their annual Easter Egg Hunt in the parking lot. I went to one of those and won a goldfish. If you wanted to see children at their worst "Lord of the Flies" behavior, this was the place to be. 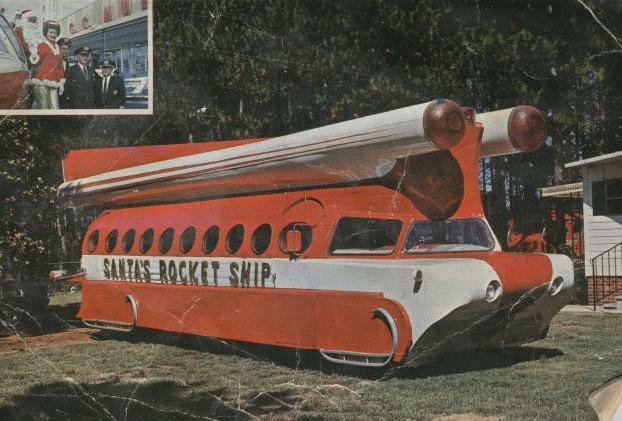 (via email, 12/13/2006) Chuck Gee sent a link to a story in The Pittsburgh Quarterly about this rocket ship: When Buck Rogers Lied to Santa. various recordings of Kappa Sigma singing groups at TU in the mid-50s. lots of tapes with my children. and, of course, multitudinous tapes of audio letters exchanged between myself and my parents in the late 50s and 60s. The home recorders vastly improved over the years. The Terecorder (an Akai product) was a big advance in about 1957 or 58. Then came the good quality stereo recorders. I still have two Akais and a Tandberg, none of which still work. My sister bought me an old, inoperable Eichor a few years ago at a garage sale, just for the nostalgia. In the 50s, the wealthy KVOO had the huge Ampex recorders, KTUL used the less expensive Magnecorders (with their fierce RPMs), and KAKC had a cheap, home variety Eichor. KAKC also had a recorder that was a little bit fancier, but it rarely worked well. But, then, a lot of things at KAKC didnt work at full capacity, including the announcers. How did you find TTM? Durn good luck, that's what it was! I seem to remember a story that some prisoner charged Rex Daugherty on a perp walk somewhere, and Rex dispatched the charging felon by bopping him on the noggin with his Bell & Howell 70DR silent film cam. The only thing Rex lost from the encounter was the footage. Crooks of the early 70's just didn't know how to play well with others, did they? Good luck installing this printer without software. A stagehand walks through the shot on "The Auction". Scroll on down this page for another image from "The Auction"
I remember Carlos Hernandez used to have a dark ring sort of mark around one of his eyes. Kind of like Pete the pup in the Our Gang films. He said he got it when some bad guy hit his camera while he was shooting. I think that was Rex Brinlee also. Rex wasn't much for people skills, was he? Carlos Hernandez, as seen by Rex Brinlee's FistCam®. My oldest son informed me that deteriorating audio tape is a disaster of giant proportions at the Library of Congress, The National Archives and other places that have rare audio dating back many years. The mention of baking them in an oven IS a viable way to extend their life, but who's going to do it? The volume is too great. Curtis Mathes is still in business. However, I don't think they have stores anymore. They do manufacture electronics for K-Mart. They have a website at www.curtismathes.com. I've been reading this site for almost a year, and it's about time I said something. The talk of Lafayette got me to write something. My uncle owned the store at 32nd & Sheridan and my mother would work there during Christmas. As a electronic nerd, I was in heaven playing with all the toys in the front and the back. As a bonus, my sister and I would get sent to the movies at 31st and Sheridan when we became be enought of a pain in the a$$ around the store. During the 80's I knew several radio people. A few times I would run up to the KMOD studio and visit John Foster (Don Foster of the old KELI's son). I would take up some beer and have a good time playing tunes. Don't think we played much off the playlist. I also know Don through ham radio. Great guy! Last I heard (late 80's) his son Scott was PD at the KATT in OKC. He probably moved on to a bigger market. I also knew Lloyd that was on Tragic 99 when that station started with the Magic format. Last I heard a few years ago, he was still on the air somewhere in Tulsa. I've been out of Oklahoma since 1990, but made it back last weekend for a few hours. Not much changes compared to here in Phoenix. Well, I ducked and Brinlees blow struck Richard, who, as he says, was loaded down with heavy camera equipment while filming the defendant. I always thought the gear acted as a suit of armor. I know Richards pride was bruised, but at least he lived to tell the story. Location: Cherry Blossom time in DC! How did you find TTM? Poor old Pappy said this TTM thing is a shot in the arm to their RCA sales! I looked up Hallicrafters on the net - defunct, now a cult radio collector thing. Then I looked up Heathkit - duh - like DeVry Tech and Bell & Howell Schools - they teach computer theory to folks. So sorry NO radios. Funny about Bell & Howell - who first imported Canon cameras into the U.S. and made great 16mm, 8mm, and super 8 cameras and projectors for so long - now they are "trainers" but like Ansco and other now defunct camera manufacturers - are licensing someone in China to make cameras under their name. Probably at the same slave labor plant making all the RCA small electronics stuff in China. BTW - did we ever find out if Curtis Mathes was still in bidness?? Yeesh, I've got quite a few 20-year-old demo tapes that won't play anymore. I need to get that food dehydrator that's supposed to be good for baking all the stickiness out of old tapes, and get these old reels baked and transferred to CDR's pretty soon. Also, I sometimes wish I had a Nagra. Those things were SO COOL! When I was 14 or 15 yrs. old back in Billings, Oklahoma, whenever I wore out the heads on my plastic tape recorder I'd send off to Olson Electronics for new ones; even if they weren't exactly made to fit, I'd make 'em fit somehow. That little tape machine would sound "great" (to me) for 3 or 4 months 'til the heads wore down again. How did you find TTM? Heard about it on the radio last night. The mention of Radio, Inc. reminds me of when I used to work at the now defunct Tulsa Radio Supply in college. Everyone from professional repairmen to guys like Leon Russell came to dig through the dusty treasures we had piled in the old warehouse. We had junk that had been long out of production and could be found nowhere else. It was a lot of fun. 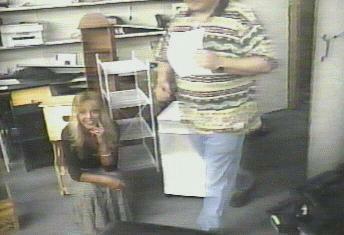 Because of my experience at Tulsa Radio Supply, Radio, Inc. offered me a job. I was flattered because they had dozens of applicants. I turned out turning them down and going back to college full-time. Yes, Mike (Miller) I do remember (more or less fondly) the wonderful Auricon Cameras....I blame (partially) my large abdominal area on amazingly overdeveloped abs from carrying the "one man band" sound rig around for hours and hours on end with the inimitable body-pod (Birns and Sawyer) in every imaginable terrain and condition (weather and otherwise). Lee, Nelson Riddle is the best back up band ever and I would rather listen to you sing over ol' Blue Eyes anytime. Keep cranking them out. About 1972, one of our band members bought a Dokoter 4 track from Burstein-Applebee, located then in Southroads Mall, I think. Repairs on it became impossible by the end of the decade. Now I have an old Teac 4 track and a 1/2 inch Teac 8 track. I have put some of my old stuff on cassette (thankfully) and I am trying to transfer the best of my old stuff to digital. Eventually, I want to dump the old reel-to-reel machines (no one would buy them anyhow) and record everything straight to digital. Some day, when all of the old machines are gone, someone may be able to make a good living copying old tape to CD. Not only does the tape deteriorate, a strong signal can be broken down through the slightest mishandling of a reel. True story: (I don't want to be a name dropper so I will call this one guy Leon and the other guy Steve.) So, one time I was talking with Leon Russell in the studio when Steve Ripley walked out of the control room and handed him a final mix-down they had just finished. Leon, absently, laid the tape box on top of a large magnetic coil speaker cabinet. I quickly pointed this out and Leon snatched it up. I don't believe the tape was harmed, but that is the type of thing we all do that makes us wonder why a tape that sounded great in the studio sounds like garbled mumbling when we get it home. Usually, the tape is OK but the problem is simply that the machine has dirty heads, or it could be that the tape we are listening to is not the one we thought it was but instead it is a track recorded by Oscar-winning legend Bob Dylan. I'll be on Jerry Pippin's radio show at 10:35 p.m. CST...in about 10 minutes. Visit the Links page to listen to the show on KBIX....(later) We talked about Robert (Reitz) Reed of Muskogee, later of "The Brady Bunch", who worked as staff announcer at KOTV for about 3 weeks before taking a permanent trip west to Hollywood. His replacement at KOTV was Lee Woodward. We also talked about the origin of Lionel, Lee's singing background, and other Tulsa TV/radio topics. Jerry is doing his "Memories" show every weeknight now, from 10:00- 11:30 p.m. You can listen on the internet; see the Links page. To Mr. Miller: I don't remember opt sound 16mm cameras, but I do recall the Auricon conversions to mag stripe film, which had the optical sound guts ripped out and a mag head stuck in its place. The Auris were essentially WWII-type cameras, made of cast iron (or something like it), and could survive a direct hit from a squadron of Zeros. There was a brace that came out of the camera and put part of the weight on your waist along with your shoulders. As Mike remembered, there was also a mic amp pack (about 10 pounds and the size of a small shoebox) that was separate. If you were in a big unionized market, you had a separate sound man (there were no camerawomen or sound women that I knew of) with you when you shot, connected by a four or five foot cord. Movement was interesting, particularly when angry crowds were throwing rocks. The Mickey Mouse ears of a 400-foot film magazine give a high profile and target, and running with 75 pounds of iron on your shoulder and a sound man tethered to the blind side was a challenge. The Auricons were only for sound on film. The gear also include a B&H 70-DR or Bolex for shooting the silent film. 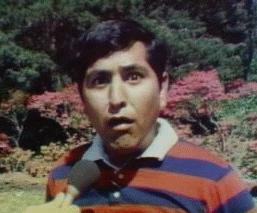 I was told that the guy who wrote Tennessee Ernie Ford's "16 Tons" shot with an Auricon. The really fancy network guys and documentary types used Nagras 1/4 in. tape recorders, which were crystal-synched to the camera for sound, but required a lot of complex work. Nagra was Polish, but I think escaped and made the recorders in Switzerland. Another one of my favorite reel-to-reels was the rack-mounted Magnecorders favored in radio newsrooms. The rewind motors on those Maggies sounded like they were from P-38s, and could rip an arm off if you were stupid enough to try to stop an errant reel from flying off at full speed with your hand. Talk about antiques, does anyone remember those huge film cameras with optical sound tracks down one side of the film? I first encountered them at KVOO-TV, Channel 2 in the early 1960s. The camera was portable (had a strap.) And there was the accompanying audio amplifier. With the large tripod, lights, cables and microphones, job qualifications centered on just how much equipment one could carry. Ya gotta wonder if 25 years from now - folks will be talking about mini-disk recording and Napster - the way we talk about that ole oxide-based tape machine gizmo stuff! We may have all worked with the old Magnacorders in mono, two-track and other formats but we LOVE our consumer EEEElectronics. I'm sure there is a bunch of wire recorder collectors out there too. Remember though Ampex invented video recording - ole Bing Crosby sank money into bettering it as a usable resource. I have "acquired" some Bing Crosby B&W TV shows (I think on ABC) that are just great. He only did a season and now Univ. of Georgia owns them. One that I have - has Bing, Frankie Sinatra, Louis Armstrong and I think Rosie Clooney. You don't see that on TV these days now in an hour show! Re Irish/Scotch brand tape, I think that was old computer tape shredded into 1/4" ribbons. The iron oxide tended to fall off, causing dropouts. Penny wise, pound foolish. (8/13/2003: Jump ahead 1.5 years to read more about Johnny Ross). "If you don't come see me, I can't save you any money!" 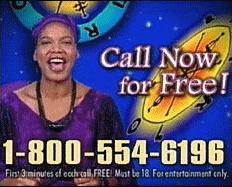 Miss Cleo (the Jamaican tarot card-reading psychic): "You're runnin' around like a pauper and he's lookin' like GQ!" and "...all my young ones: 'Are you keeping it real, Miss Cleo?' I keep it real and that is the key, keepin' it real. No reason not to." Uncola man? Find out in Infomercial Hell! I had no idea a mere mention of reel to reel would elicit such an outpouring. But among broadcast types, it is easy to understand. As some may know, I was a voice major at North Texas State. My recent use of my Wollensak (purchased from Burstein-Applebee on 41st Street, a block west of Sheridan) was to record songs. I recently discovered that you can purchase the most wonderful original charts on CD or cassette of your favorite singer. Since Sinatra had the best arrangers and his key is my key, I chose his. These are original Nelson Riddle backgrounds and I have really enjoyed getting the "pipes" tuned again. The Wollensak has a mixing input that allows you to create the "echo" effect. With a separate mixing pot, you can achieve a very nice balance. I have fourteen songs in the can. This recorder has got to be twenty-five to thirty years old, and with some repairs along the way, still works great. I also suggest to all who have memories on 1/4 inch reel tape to get them onto cassette fast. I almost lost a ton of stuff to oxide sluffing. Well, Lee, if you ever wish to debut one of your songs to an international audience, send it on, and we'll have a special presentation here. You might wind up on Napster! Ooooh. Burstein-Applebee was the biggie electronics firm in Kansas City. Hubba hubba. How did you find TTM? Came in a pack of Radio Shack "acid cells"
Being a Chicagoan - we had Olson Electronics (from OH - now defunct) where I got my first transistor - not crystal - radio; gigantic Allied Electronics on Western Avenue in Chicago - merged with Radio Shack whom we thought then a hick, "junk shop" buyer-beware outfit out of Texas compared to Allied; and LRE - LaFayette Radio Electronics. We called it Lah-FEE-ett. Olson's had a major Chicago store 2 blocks from Allied - couldn't find something there - you went to Allied. Olson's later had a branch store in my home town. AND THEY ALL HAD CATALOGS! We - as techno-geeks - all read them and saved them. My Dad often would be at Allied in Chicago on a Sunday morning at 9am looking for tubes and TV parts. Yes - they opened at 9am on Sunday for then what was called "do-it-yourselfers"! Till solid state came around - he fixed our home TV's and those of neighbors - no charge. My Dad was a neighborhood hero to kids - he bought supposedly non-functioning cheapy Allied walkie talkies for like $9 a pair and would get them working. Unfortunately Allied often had them loaded with crystals that were not on the same frequency as other models and he would find crystals that WERE alike to make sets work. Hallicrafters had a deal with Joliet State Prison - inmates made radios and they got to keep some as pay - so sometimes you could hear "cons" on the SW or CB band - talking to the outside world. HEATHKIT - over in Michigan - made the "Benton Harbor lunchboxes". It was a radio kit company that got into computers and later Zenith bought them out...We had a branch store here in VA. Catalog sales only for many a year. Can you imagine folks building radios now? Ooops - folks DO build computers now - so I guess the DIY's - as they call them in Britain - are still with us! 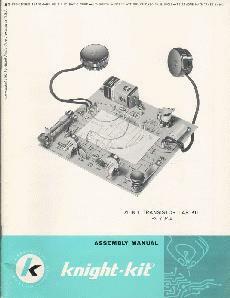 I drooled over those catalogs -- Allied, Lafayette, Heathkit, PolyPaks (Transistor Grab Bag! We Can't Test 'Em! NPN! PNP!) and one other, although I doubt it's spelled right -- Bursteen-Appleby? Norelco changed news gathering with the compact cassette deck. Wish I had one of the many I sold in the late '60's with the high-end broadcast mic option. I bought a Sony 110 cassette recorder in 1970 - which I used for news. It WAS then the portable radio news gathering standard. I still have it but after loaning it out to a friend it came back with the built-in mic picking up feedback from the speaker when recording. You would lay it down on a table in front of a speaker and it did a credible job of getting decent room sound but for real interviews, you plugged in a mic - I had a cheapy Sony and my E-V 635 which I still have today! When a kid in Chicago - Mills Recording was this storefront pro audio dealer/studio on Michigan Avenue in Chicago - ther building it was in has been long torn down. Mills had 2 voice over recording studios and sold Ampex, Uher, Akai/Roberts, Sony, and Tandberg decks. Back in the late '60's - they used to do location recording of weddings! Before video and besides stills -a lot of folks had recordings made and gave away records of the ceremony! How times have changed! Speaking of "kreplach" (a triangular-shaped dumpling usually found afloat in a bowl of chicken soup), Orson Bean once told a story about a boy who had an aversion to it, exclaiming "Oy, kreplach!" and running away when presented with it. The concerned mother consults with a wise old rabbi. The rabbi explains to the boy what it is and how good it is for you (in Orson Bean's impeccable Yiddish accent). The boy takes this in, smiling and nodding. The rabbi advises the mother that all is now well. When she next puts kreplach in front of the boy, he exclaims "Oy, kreplach!" and runs away. I have a box under the desk in my office with a 1966 Lafayette Radio Electronics reel to reel recorder, last used professionally to listen to some radio promo spots before our studios got fully commissioned in 1991. I have a couple of boxes of tapes, the high point of which is a radio news spot I did back in the early 70's with ex-Georgia Gov. Lester Maddox. Most, however stand as silent reminders that I don't have any hopes of a career as air talent. One of these days, I'll copy them to cassette or CD if'n I ever get a RW drive. Meantime, they sit, ever closer to having all the oxide fall off the acetate base. Lafayette was a mail order/retail outfit in Syosset, Long Island. Its major competition back in the 60's was the Allied catalog. Allied got bought out by some little Texas outfit called Radio Shack. Wonder what happened to them? Lafayette had a store around 32nd and Sheridan in the 60s. 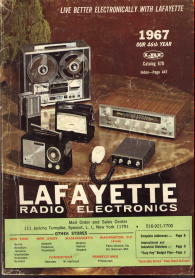 I've managed to hang onto a 1967 Lafayette catalog that I used to slaver over. I see that you could have picked up an Ampex home video recorder for a cool $1500. Got the Allied catalogs every year, too. My 21-in-1 Knight-Kit transistor lab was permanently set on the AM transmitter. I bought a Sony reel to reel deck when at TU but Sony stopped making my model and all I got was a refund check! Steve Smith and all others into radio had Sony 777 decks - the Cadillacs of location recording. In about '71 -there was a Freight Damaged warehouse down by where Mecca Spice moved to. Some high dollar hi fi joint burnt down in KS and the folks there salvaged a lot of great Ampex, Sony, and other high end audio recorders and tuners. I think Paul Goelz at KWGS tipped us all off and folks from John Mabee Hall cleaned the pace out. 90% of it worked but all stank from smoke damage! You could enter a dorm room and smell where the tape gear came from! Still have a Columbia reel to reel from high school days - only took 5" reels but I used it to grab bad interviews for high school FM back in the last century. For "real" interviews with the likes of Jack Benny, Herb Alpert and Bill Dana - we lugged one of those silver, heavy 3M Wollensack ac-only decks. We drooled over Uhers and Tandbergs that "real" radio news stations then used. Till the day we saw Sig Sakowicz - a long-time WGN fixture -interview Jack Benny. Sig used a Wollensack - just like ours! Lee Woodward had just commented on reel to reel tape recorders and chug holes. Doug Dodd for Congress? It may happen. The site of the mother of all libraries, Alexandria, Egypt, was heard from. A former and future Tulsan there brought up some interesting items in his comments and questions. We learned that Ron Franklin, sports director at Channel 2 from 1967-1971 is currently a sports analyst at ESPN, and called the recent TU N.I.T. championship basketball games. We saw a picture of the giant milk carton-shaped vending machine that dispensed milk to Tulsans in the 60s. Speaking of beverages, we saw some vintage pop bottles from the Tulsa area on a new page. Former KOTV newsman Larry Thomlinson visited for the 1st time, leaving great stories about KRMG's Johnny Martin and KOTV's Buddy Allison. The Tulsa Tribune's former entertainment editor, Bill Donaldson, was remembered and seen. Uncle Zeb had a bit of poetry composed for him. We began with a discussion of current local radio alternatives. Check it out via the link at the beginning of these comments!